George Wadman was born in West Coker in 1808 and baptised on 26 June 1808 at St Martin of Tours church, West Coker. He was the son of George Wadman (b1780) and Elizabeth née Abbott (1782-1858). Nothing is known of George's early life but on 31 January 1831 he married Mary Stiby (1805-1889) at Bradford Abbas, Dorset. 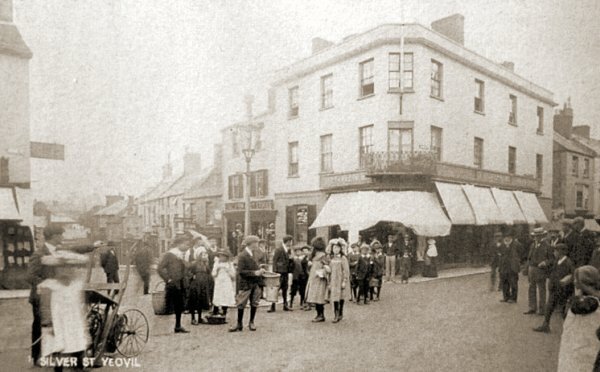 Mary was the daughter of Robert Stiby They set up home in Yeovil where they had four children; Mary Stiby (1833-1900), George (1835-1907), Elizabeth (1837-1877) and Robert Stiby (1840-1922). George was a silk mercer and draper and was clearly making a good living since in 1837, described as a mercer and draper of Yeovil, he invested £1,000 (around £775,000 at today's value) buying 20 shares in the South Western or Kingsworthy and West Monkton Railway. In the 1832 and 1841 Voters' Lists he was listed by virtue of owning 'freehold houses' in the Borough. The Somerset Gazette Directory of 1840 listed George as a draper of Silver Street. However, George's business establishment was soon transferred to Middle Street, at the junction with Vicarage Street - albeit not in the present building. In the 1841 census George and Mary were listed at the property with their four children, three draper's shopmen, an assistant, three draper's apprentices (including one female) and two domestic servants. George gave his occupation as a silk mercer. However the Churchwardens' Accounts of 1844 noted him as a draper and in 1847 as G Wadman & Co. In 1844-45 George served as a Churchwarden of St John's church and in 1846 he was elected as a Town Commissioner. 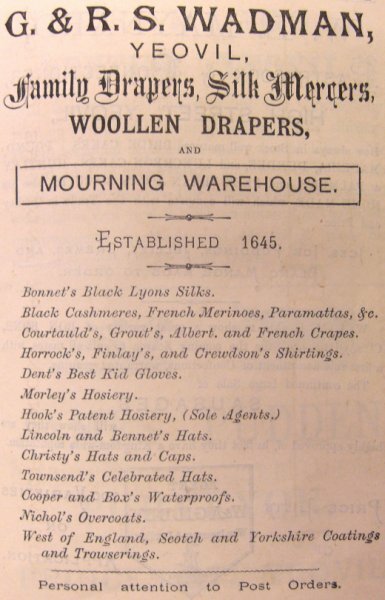 Hunt & Co's Directory of 1850 listed 'Wadman & Co, Linen & Woollen Drapers of Middle Street'. 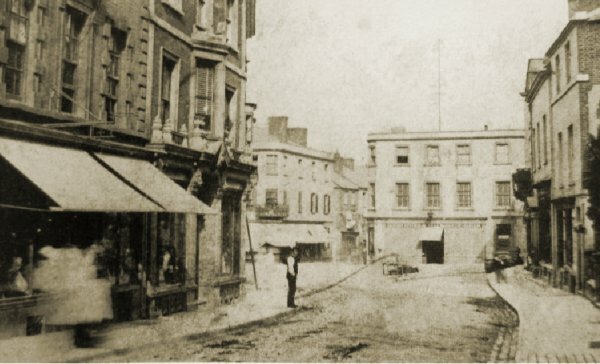 By the time of the 1851 census had moved his business to London House, on the corner of Middle Street and Silver Street facing the Borough, and he and his family lived above the shop. London House was built on the site of the Church House. The Church House was sold by 1836 for £699, demolished and at its location was built London House, so when George moved in the premises were relatively new. Slater's Directory of 1852 listed Wadman & Co as 'Tailor & Linen Draper of Middle Street'. In 1854 George was elected to the Town Council, polling 68 votes. George Wadman was still living in the accommodation above his shop in London House by the time of the 1861 census in which he gave his occupation as 'Silk Mercer & Draper'. Living with him and Mary were George Jnr and Mary Jnr, together with five draper's assistants, an apprentice and two domestic servants. The 1866 Post Office Directory listed George as a linen draper of Middle Street, but by the time of the 1871 census he had retired to live at Southbank Villa (see Gallery), Preston Road, with Mary their daughter Elizabeth and a domestic servant. The draper's business continued to be run by his two sons; George Jnr and Robert. the 1872 edition of Morris' Directory listed 'G & RS Wadman (established 1645), Silk Mercers and Drapers, 1/2 Middle Street, 1 Silver Street'. The 1875 Post Office Directory listed 'George & Robert Stibey (sic) Wadman, drapers, Middle Street'. George Wadman died at his home, Southbank Villa, on 19 March 1875. His will was proved in July 1875 and his effects valued at under £3,000 (in the region of £2 million at today's value). 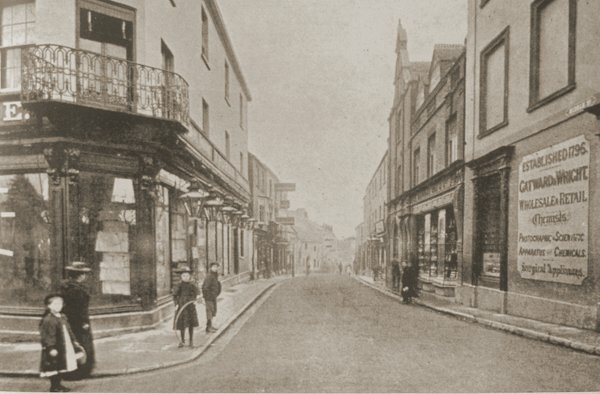 This photograph was taken by Yeovil Photographer Jarratt Beckett and published in his 1897 book "Somerset viewed through a Camera". At left is London House, at this time being run by George Wadman Jnr. 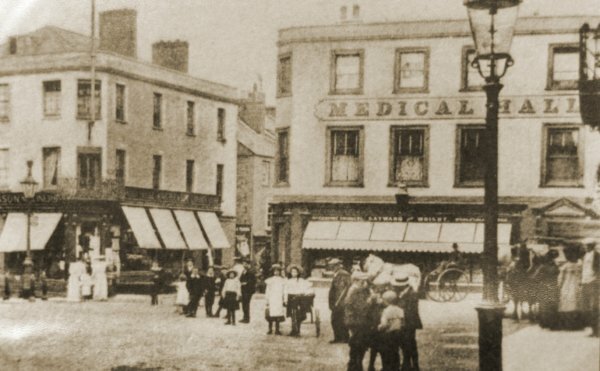 At right is the side of the Medical Hall which, at this time was occupied by wholesale and retail chemists Gatward & Wright. Next door to the Medical Hall was the International Stores. 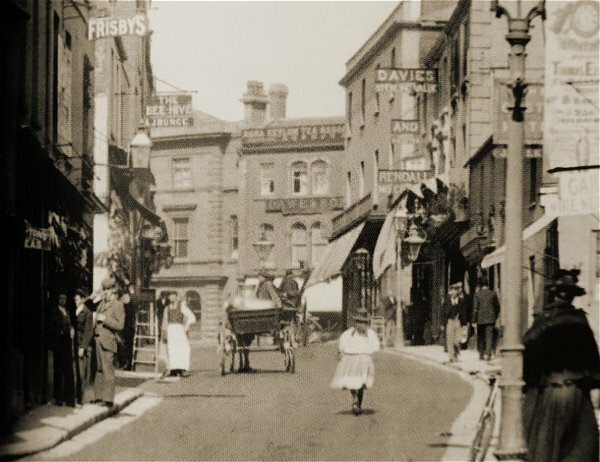 This postcard was produced around 1900 from the Borough, looking towards the junction of Silver Street at left and Middle Street at right. The large building on the corner was London House, for many years, the premises of George Wadman and later his sons. 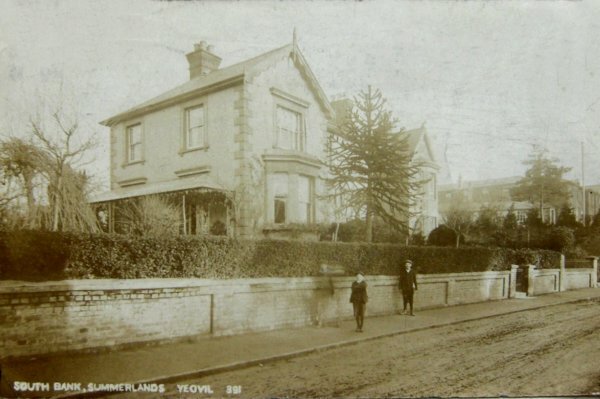 Southbank Villa, Preston Road, from a postcard of around 1910. George Wadman retired to live here during the 1860s and died in the house on 19 March 1875. After their father's death in 1875 the business was run by George Jnr and Robert. This is one of their early advertisements from the 1878 edition of Whitby's Yeovil Almanack Advertiser. Note that the brothers claimed to business to be founded in 1645.